Castleknock Hotel is the ideal location for hosting your corporate summer BBQ in 2019. Enjoy the serene surroundings of our hotel and golf course whilst our professional team ensure that you and your guests are looked after, leaving you to relax, unwind and really make the most of the summer evening. Located fifteen minutes from Dublin City Centre and next to the Phoenix Park, our location provides you with the space and ambiance of the countryside, whilst still remaining close to the heartbeat of the city. Our stylish private courtyard area is picturesque on a long summer’s evening, and our outdoor heaters mean you will remain cool and comfortable even when the sun has set. With 190 bedrooms in the hotel, your guests have the option to enjoy a comfortable night sleep with us at a discounted rate. With the unpredictability of Irish weather, we also have an alternative indoor set-up available in the comfort of our Lime Tree Bar in the case of bad weather. Catering for a minimum number of 30 guests, our BBQ menu offers a delicious selection that is sure to impress. 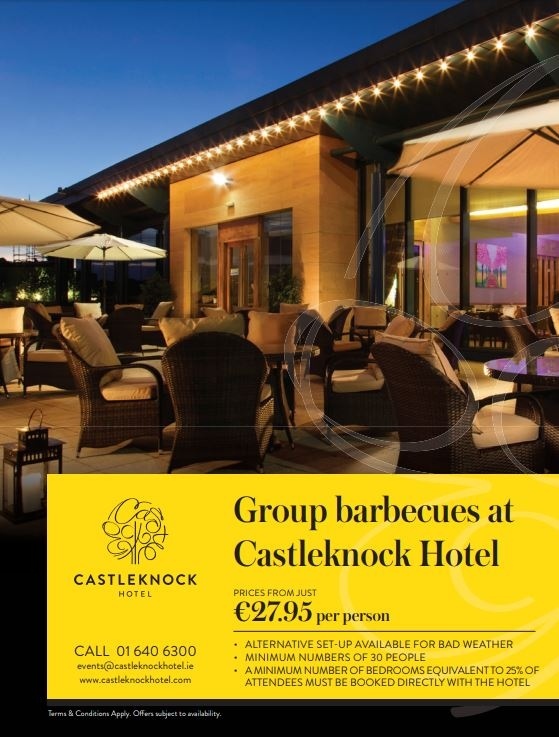 Booking your BBQ at Castleknock Hotel also brings some exclusive discounts should you decide to stay or book any future conferences or meetings with us in the future, as well as discounted treatments at The Spa and green fees at Castleknock Golf Club. We ask that a minimum number of bedrooms equivalent to 25% of attendees must be booked directly with the hotel on the night of your BBQ. For more information on corporate events, contact events@castleknockhotel.ie or contact 01 640 6300.